Join the community of Tohu supporters and help us to continue to operate. Or make a single payment. 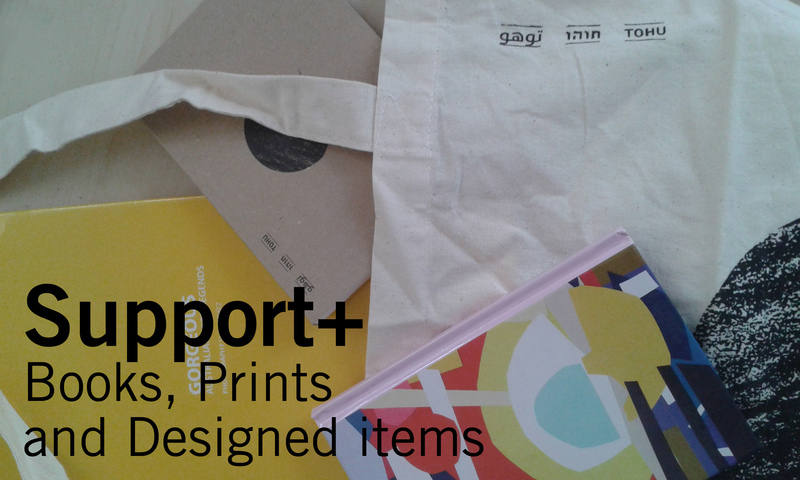 - Tote bag and notebook designed by "The Studio"
Tohu is an independent art magazine, a not-for-profit organization for the advancement of original, multi-voiced writing about art. Each piece in Tohu is published in three languages: English, Hebrew, and Arabic. As a part of its agenda Tohu receives no funding from any government or art institution, relying solely on donations. The establishment of the magazine, in October of 2015, has been made possible thanks to the wonderful support of many people in the art and culture communities. Where do the donations go to? Tohu's editorial budget is dedicated to paying writers and translators. Your contribution will allow us to continue to strengthen the magazine's activities and to create a meaningful platform for writing on contemporary art in our region.